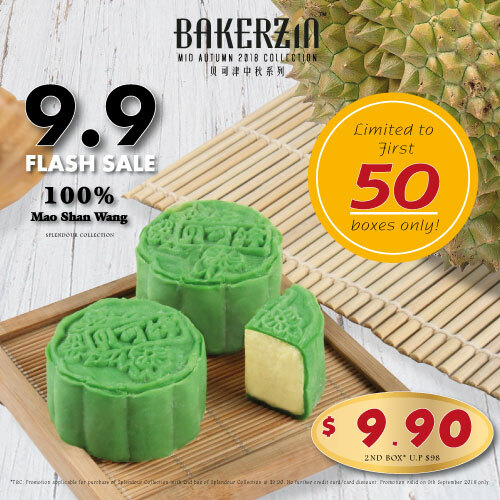 Friday | September 7, 2018	Only on 9 September, Bakerzin is having a flash deal for their Splendour Collection mooncakes for $9.90! The Durian Snow Skin mooncakes are inspired by elegant emerald gems and made from 100% pure Mao Shan Wang durian. A league above the rest, sourced for the best top-quality premium grade durians from Malaysia for the utmost indulgence for this Mid-Autumn Festival. Buy the first box at the normal price of $98 (box of 8 pieces) and enjoy the second box at $9.90! Savour creamy delicious durian mooncakes at any Bakerzin outlets and mooncake booths that are perfect for durian-lovers with this amazing deal. Terms & Conditions: •	Promotion applicable for purchase of Splendour Collection with 2nd box of Splendour Collection at $9.90. •	No further credit card/ card discount. •	Promotion valid on the 9th September 2018 only. •	Limited to first 50 boxes per outlet/booth. •	Valid at all Bakerzin outlets and mooncake booths.